Incandescent light bulbs are joining 8-track players and Betamax VCR’s in the land of obsoletion. The switch to energy saving bulbs that last years rather than months has been in place for some time now, and the prices are not as high as they used to be. CFL’s (compact fluorescent lights) and LED’s (light emitting diodes) seem to be the way of the future in many aspects. The length of time they last and the lower amount of energy used are both very big selling points. However, before the switch is made, there are several factors to consider as well as myths that need dispelled. The support for CFL’s has grown in the last several years, phasing out traditional incandescent bulbs. The older light bulbs would last for a matter of a few weeks, whereas CFL’s last for years. Fluorescent lighting is certainly not a new concept, as most of us are familiar with the long cylinders of bright light that are used in many businesses and schools. As far back as 1857, a physicist named Alexandre E. Bequerel was studying new theories about fluorescence and placing a phosphorus substance inside tubing to create light. There were some experiments he conducted with luminescent materials and electric discharge tubes, but the true breakthrough came at the turn of the century. An American electrical engineer named Peter Cooper Hewitt and a German physicist named Martin Leo Arons worked together to create the first mercury vapor lamp(pat. 1901). Fluorescent lighting is created with a glass cylinder coated on the inside with phosphorus substance and filled with mercury vapor and argon gas. At each end of the tube is a metal filament, either straight or coiled, which heats when electricity is applied. As the voltage increases, the tube begins to glow. Once the electrons start moving back and forth between the filaments, they collide with the mercury atoms, which in turn create ultra violet rays. These rays are invisible, however when combined with the phosphorus material, a bright light emerges from the tube. As time and technology has increased, this way of lighting has been made possible for the needs of the average home. 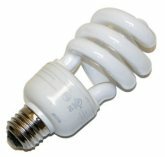 Compact fluorescent light bulbs last up to ten times longer and save energy to boot, and while they are initially more expensive, in the long run money is saved because not as many need to be purchased. These bulbs certainly save energy, and while they take a bit more to produce, the overall lifespan compensates. However, there are some flaws to the energy-saving theory, namely in regard to heating and cooling. When a fluorescent light is on, the overall heat in the room drops. Certainly during warmer months, this would be ideal in keeping cooling costs down, but in colder climates it would actually increase the amount of heating energy needed for a home or business. The energy from light usage itself with a compact fluorescent is an average of 25% less than regular light bulbs. Life spans range from 6,000 to more than 15,000 hours in comparison to a mere 700 – 1000 hours of incandescent bulbs. All in all, some very good selling points – but as with all things, there are criticisms and disadvantages. One complaint about fluorescent lighting stems from the time it takes for one to turn on. Because it takes a minute or two for the electrons and atoms to start bouncing off of each other, it is not instantaneous light. Many people dislike the harsh lighting from fluorescent bulbs, although many CFL’s are now designed with colors to produce softer light. CFL’s do fit in incandescent light fixtures, but consumers have reported not being able to replace lamp or bulb covers due to the base of the CFL being larger. The biggest concern however has nothing to do with cost or appearance, but rather the potential for harmful mercury to be released if the bulb is broken. It is important to note, while the myth that an EPA HAZMAT team must come in to clean up the mercury released from a broken CFL is unfounded, there are crucial steps that must be taken to minimize potential damage. Mercury is highly toxic, so if a bulb is broken, do not vacuum up the pieces. This will heighten risk of the mercury becoming airborne. Instead, follow these steps in the order given to safely remove the fragments and powder. 1) Evacuate everyone (pets included) from the room immediately when the bulb is broken. 3) Shut off any centralized heating or cooling unit. 4) For hard surfaces, use an unyielding, disposable scoop (such as cardboard) carefully, and without touching the fragments, scrape up all of the debris and put immediately into a glass or plastic sealed container. For carpeting, repeat above process, and in addition, take duct tape, sticky side up, and pick up all remaining visible material. Only then is it advised to vacuum the specific area, and the bag must be removed and sealed in a plastic container to await proper disposal. It is also important to remember that the next several times of vacuuming that room should be done with a separate bag that is immediately sealed and properly disposed, as well as the central heating/cooling unit being shut off while vacuuming. 5) Continue to air out the room for several hours before letting anyone back in. 6) Once properly sealed, place containers in the trash until you have contacted your local refuse service to see what is required for disposal. Some city governments require that the material is taken to the local recycling center as opposed to the regular trash service. Following these steps will greatly reduce the risk of any damage from the mercury exposure. It is also a good idea to put some kind of paper or cloth underneath the light when a bulb is being changed. That way, if there is any breakage, it can easily be disposed of. The myth about HAZMAT originated from a case where a Department of Environmental Safety worker in a local office advised a woman who had broken a CFL bulb in her home to call the EPA and have a HAZMAT team come out. This was, in retrospect, completely unnecessary, and it ended up causing a larger scale problem than it would have originally. Snopes debunked the HAZMAT myth, along with giving the true and accurate information for disposal of broken CFL bulbs. The concern from possible mercury contamination is a very valid one, however it should be noted that many people use these energy efficient, long lasting bulbs with no negative results. Although they are still higher in initial cost than a regular light bulb, they have lowered considerably from their original prices. For those that are still leery of the potential mercury hazard, there are other types of energy efficient lights that aren’t powered by toxic substances. LED (light emitting diodes) lamps are preferred by some due to the safety factor and the even longer lifespan. Solid-state lighting (often used for traffic lights) are also powered by electroluminescence, or the material producing light from electrical currents. These may compete with compact fluorescent bulbs, and are going even farther in pushing out the incandescent bulbs. If the proper precautions are taken in case of accidental breakage, the compact fluorescent bulb has many advantages. Overall, consumer feedback has been positive, and many are pleased with not having to replace light bulbs every month as well as lower electric bills. Just remember, as with any purchase, always research the information available to make an educated choice. Although I have had issue on ocassion where cfl’s burn out too soon, they do reduce energy use significantly. I also like that they eventually provided better color temperatures from which to choose. At first they only provided bulbs with color temperatures around 3000, which more closely matched incandescent bulbs, but it was too orange. They later came out with a color temperature of 5000, but this was too blue. Now you can get them at color temperatures between 3500 and 4000 which is more white, and too me, more comfortable.